Enter the stunning world of pendant hoods designed to look elegant to enhance any kitchen. 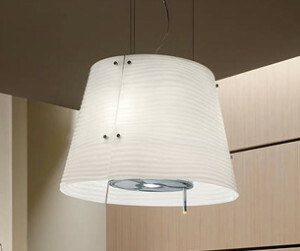 Pendant extractors are a decorative hood that more resembles a light shade fitting than a hood. This type of hood hangs from the ceiling over the hob area and uses re-circulation method to filter the air but they are not designed to duct out. Take look at our stock offers of pendant hoods…..